Utilizing rotating film cartridges to apply stretch film as they move around the load, overhead pallet wrappers are commonly available as semi-automatic and automatic systems. For versatility, this type of mechanized wrapper works well for light, fragile loads and unstable, heavy ones. Rotary Arm Overhead - With these models, the load is stationary and the rotary arm does the wrapping. For loads too unstable to be rotated, a rotary arm model would be suitable. Rotary Ring Overhead - These wrappers are known to keep loads stationary but utilize a ring-shaped track system to guide the wrapping mechanism instead of an articulated arm. These stretch wrappers are very efficient and can operate constantly. Millwood has engineered both automatic and semi-automatic stretch wrappers available to meet each of our customers’ unique needs. 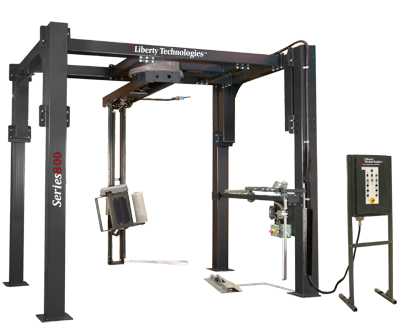 The semi-automatic wrappers offer a balance of easy operation with user control while the fully automatic stretch wrappers require no operator. Semi-Automatic Overhead: For low-volume operations, processing 10 to 40 loads an hour, a semi-automatic stretch wrapper is a potential solution. These wrappers safely unitize loads and lessen the margins for inconsistency. Automatic Overhead: With no operator intervention during the cycle required, automatic stretch wrapping machines ensure a consistent wrap every time. Loads are typically brought to the machine on a conveyor belt so that the machine can automatically begin wrapping. These systems can generally process up to 100 loads an hour.